The installation is from the DVD and it does take a while to load. This is due to the extensive amount of ClipArt included with the software. There is an on-line tutorial, taking the user through the creation of a scrapbook page, including the insertion of several pictures and text. The Help system is extensive and very good. The on-line Help provides step-by-step directions for any particular task you want to perform. There are also Help notes for each item on the Tools Palette. Between the tutorial and the on-line Help, the beginning user should have no difficulty creating scrapbook pages. This is the main menu in the Help system. It is broken down by task. Upon selecting a main task, you can then further select the specific area in which you need help. You begin by selecting a page size. iRemember supports wide format inkjet printers for creating 12 x 12 scrapbook pages. 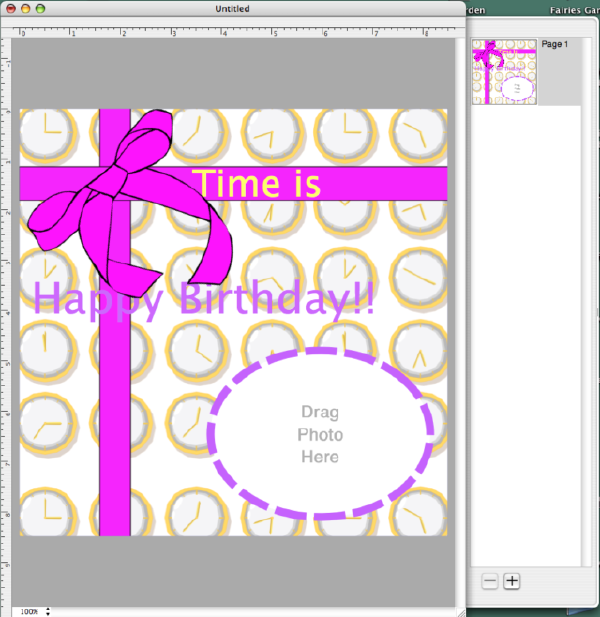 You can also select 8.5 x 8.5 (for use in creating invitations) or create a custom size for your particular project. You can then go to the iRemember ClipArt to use one of the templates provided. Included with the clip art are backgrounds, poems, quotes, embellishments and patterns. There are templates for many occasions. Or you can create your own page. I did this by bringing in a photo, reducing its opacity and using it as a background for other photos and text. 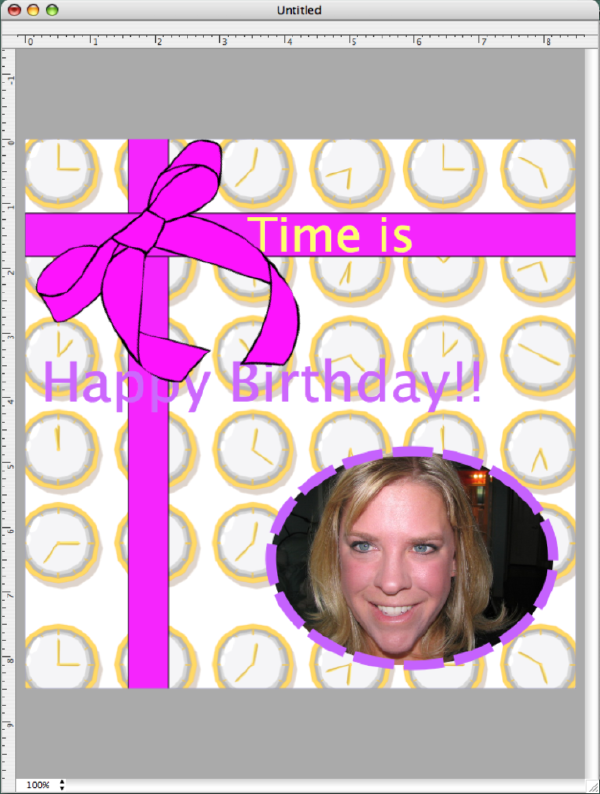 Here is an example of using a template to create a birthday page: First, a new album is created. Then a template is selected and dragged to the album page. You can import or drag photos from iPhoto or Finder. Any changes you make to your photos in iRemember will not affect the original photo. You can crop your photos, rearrange them on the page, or rotate the photos. The Toolbar has several shapes – the rectangle, oval, and about a dozen others. You can create a shape on your page, and then select and drag your photo into the shape. You can increase the photo’s size to completely fill the shape. You can put frames or corners around your photos. iRemember gives you the flexibility to quickly create scrapbook pages. You can export these pages as .jpeg files for sending to family and friends. If your scrapbook has more than one page, when you export it as a .jpeg file, iRemember saves each scrapbook page as a .jpeg file. I liked the ease of use. I started using iRemember when I first received it. Then I didn’t use it for at least a month. With its great Help system, I was able to quickly refresh my memory about some of the techniques and created several more pages fairly easily. This is an excellent software package for anyone who wants to do digital scrapbooking but doesn’t want to learn all the techniques available in Photoshop Elements. The pages created through iRemember look great. However, there are a limited number of shapes available for use. In Photoshop Elements, you can be much more creative with shadows, bevels, and craft more unique and complicated pages. You have to decide how much time you want to spend on scrapbooking. 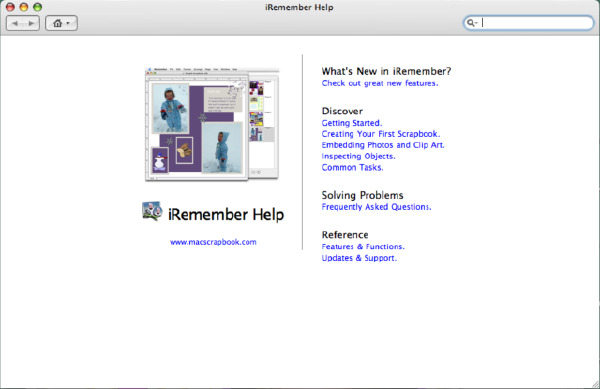 For the person who wants to create scrapbooks but is limited by time or creative ability, iRemember is the way to go. iRemember is definitely a quick way to get started in digital scrapbooking. Not only is it a good piece of software for adults, I feel it would also appeal to children ages 10 and up who are looking for something creative to do on the Mac.